Born 7 April 1911, Ayr, Scotland. 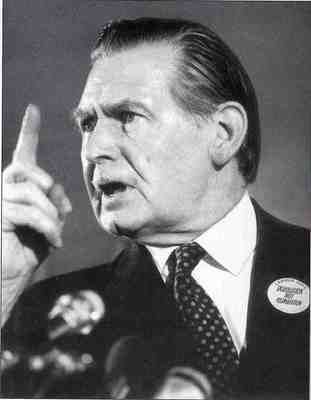 Secretary of State for Scotland, 1964-1970 and 1974-1976. Willie Ross was responsible for creating the Highlands and Islands Development Board. Willie Ross was a Glasgow graduate and honorary graduate who became a Labour politician and was Secretary of State for Scotland from 1964 to 1970 and again from 1974 to 1976. 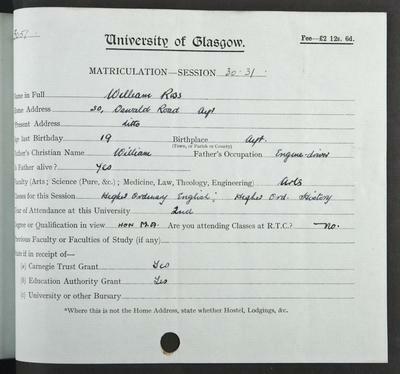 He was born in Ayr in 1911 and was educated at Ayr Academy before matriculating at the University with the support of a Carnegie Scholarship. He graduated with an MA in 1932. Until the start of World War II he was a primary school teacher. During the War he served in India, Burma, Singapore, and Ceylon, reaching rank of Major and being awarded a military MBE. He became interested in a career in politics after the War and won a by-election in 1946, becoming an MP in Kilmarnock, a position he held until 1979. In 1964, under Harold Wilson's Labour government, he became Secretary of State for Scotland. He spent a total of 8 years in this role making him the longest serving Secretary of State. He died in 1988.